After finishing in second place at the Corvallis Regional and earning a bid to the Opening Round Championships, the Huskies made the trip to St. Louis to compete against 23 other teams for one of six coveted bids to the National Championship Tournament. UW began the weekend against Washington University in St. Louis B. It was a strong opening round for the Dawgs, who won decisively to put themselves in a great starting position. Next, the team battled west-coast rival Cal B. The round was close, and the margins were a bit slimmer, but the result was the same. At the tournament halfway point, Team 1269 was undefeated with a 4-0 record. As a result, they were paired against the only other undefeated team, Washington University A - widely considered to be the strongest teams in the field. It was a fun round, and one that demonstrated UW's toughness and ability to compete against the nation's best. The Huskies earned both of that round's ballots putting them in poll position for the weekend. By the start of the final round, the mockers had already secured a bid to the National Championship Tournament held in April in Orlando, Florida. 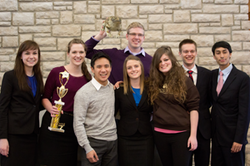 Still, they had one final opponent--Creighton University--whom they cruised past en route to a program-first undefeated record at an AMTA tournament! This victory was easily one of the strongest the program has ever seen. UW earned it's third NCT berth in program history and finished with a perfect record for the first time in nearly two seasons. On top of that, seniors Kaleigh Boyd and Rio Frazier earned intercollegiate honors for their performances. As one of only a hand full of teams to finish with an 8-0 record at the Opening Round Championships, it looks like the Dawgs are in great position to battle the nation's best next month in Orlando!